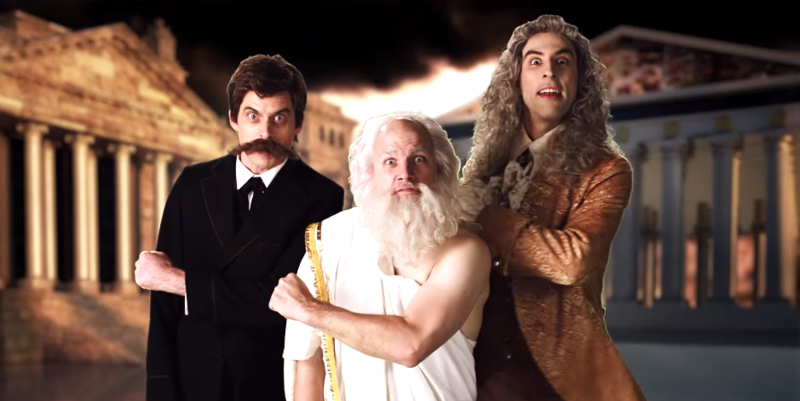 ERB explores the history of philosophy in a huge battle featuring ERB regulars EpicLLOYD, Nice Peter and Zach Sherwin as the western philosophy team (Socrates, Nietzche and Voltaire) as they go against guest stars Timothy DeLaGhetto, MC Jin and KRNFX as the eastern philosophy team (Sun Tzu, Confucius and Lao Tzu). Peter has always wanted to use Socrates in a rap battle, and apparently once worked on a Socrates vs. Confucius rap battle which didn't yield very interesting results. After discussing it with the fanbase, he decided to bring in some extra rappers and guest stars to spice up the battle. Buddha, Dalai Lama, Plato and Aristotle were all considered, as well as guest stars Nigahiga and Dumbfounded, before the final cast was chosen. The deep history of the idea did not keep the forum from getting excited. In fact, the match-up was very highly anticipated and surprisingly uncontroversial. This battle must have been really tough to write. I'm looking forward to how they handle the actual disses. The reason why it is tough is because philosophy in general is confusing unless you really take the time to understand it. Eastern philosophers are very conservative. They are all about tradition and tranquility. Which is why it will be funny to see them in a rap battle. However, it must be tough for writing jokes. I feel it is easier to diss Western philosophers because they are more bold and make very controversial claims. They also have more of a personality. I'm looking forward to this battle because I'm curious to see how they will pull it off. I'm super excited for this one. This is the one I was looking forward to the most. It has been a while since they have made historical characters goofy and funny, so I'm hoping they do that with this one. Like maybe have Socrates act like he did in Bill and Ted. I really like the idea of this battle. Socrates vs. Confucius has always been a heavily requested battle as far as I can see and having other philosophers to back them up will really spice up the battle. I mean, there'll still be the people who will go "battle suxx I dunno any of these guys" but what interesting battles could be done if every character had to be known by everyone watching the video?? Really excited for Sun Tzu especially, I think he'll bring a nice style to the table that should be fun to see. I'm so excited for this one. My dad teaches philosophy so I know some stuff and I'm really pumped, especially for (hopefully) Socrates.